An additional computer is a computer that is not the Server. It can be a POS Point (TILL) or a back office computer (ROBOTILL Manager). The server already needs to be installed before you can install additional computers. Click here to install the server. Before you do the install, you need to make sure that both computers (the one you want to install on and the server) is connected to the same network (LAN / WIFI). To do a simple test to see if the computers are connected see Network Test. Note: If you by mistake already installed ROBOTILL on this computer as a stand alone computer or a server computer, then you need to follow these steps to link the computer to the server instead. Run the ROBOTILL Setup program (the same setup program you used for the server computer that you can download from here). After the install completed, open ROBOTILL Manager or one of the ROBOTILL POS modules. 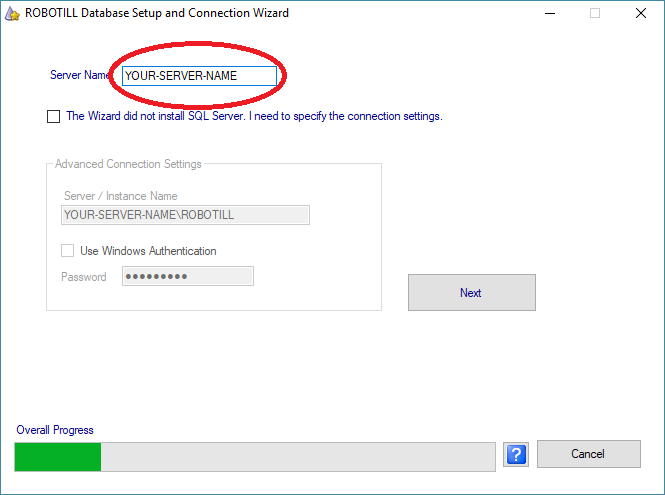 The ROBOTILL Database Setup and Connection wizard will open. Click on 'Begin Setup'. Select 'Additional Installation' and click on 'Next'. In the Server Name box, type the computer name of the ROBOTILL Server that you installed. Note that it needs to be the computer name as displayed on the network and not the computer description. Click on 'Next'. 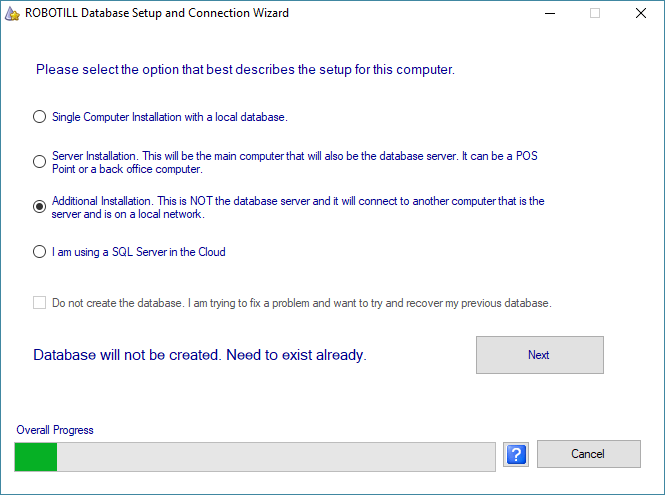 The Wizard wil not install SQL Server but will instead connect this computer to the server that is already installed. If you get an error message after you followed these instructions carefully, click here.